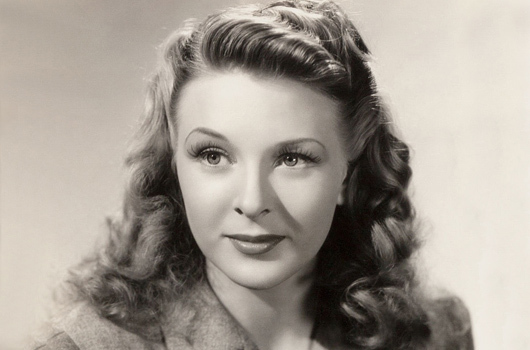 Evelyn Ankers, star of numerous horror movies throughout the 1940s, was born in Valparaiso, Chile on the 17th of August, 1918, to English parents. The family returned to England in the 1920s and the young Evelyn Ankers appeared in films while still at school. Flowering into a beauty, it was only a matter of time before she attracted the attention of male admirers, and after turning the head of Hungarian born British film producer Alexander Korda, she appeared in her first film in 1937, Bells of St Mary’s, for MGM. After a stint honing her craft at RADA, Ankers would make three further films for Korda – Rembrandt (1936); Wings of the Morning (1937) and Fire Over England (1937) – before winning her first lead role, as Dorothy Osborne, in the 1938 Albert Parker-directed British crime movie, Murder in the Family. Emigrating to the United States on the day Great Britain declared war on Germany, Evelyn Ankers signed to Universal in 1940, a move which would define her career for both good and ill. 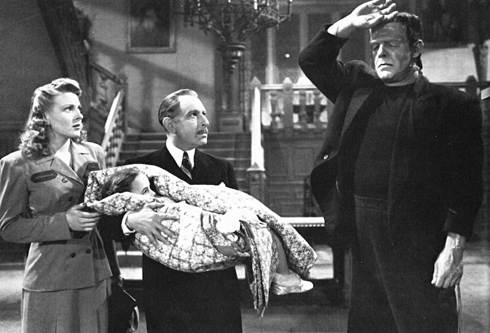 Her Universal debut came in the Abbott and Costello spook-comedy Hold That Ghost (1941), but it was in her role as Gwen Conliffe in The Wolf Man (1941) that she really made her mark. Watching The Wolf Man now, one is struck by how understated Ankers is – particularly when contrasted with some of Lon Chaney Jr’s more stilted acting. From the moment we first see her – glimpsed through the eyes of Chaney in a shameless act of voyeurism – there’s a remarkable delicacy to her performance. 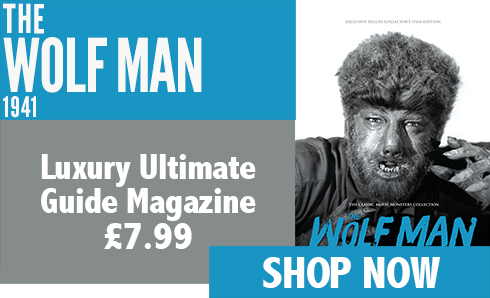 Throughout the ensuing madness, she exhibits a warm sophistication coupled with acute tenderness – indeed, it’s her sympathy for Chaney’s Wolf Man which gives the film its emotional power. Given this unruffled, effortlessly refined exterior, it is even more astounding when, in the film’s last frenetic moments, she lets rip with her devastating, raw scream. She would work with Chaney a total of seven times, and the apparent animosity between them was popular knowledge – although a wealth of light-hearted photographs of the pair indicate that at least some of the antagonism was for the benefit of the cameras. 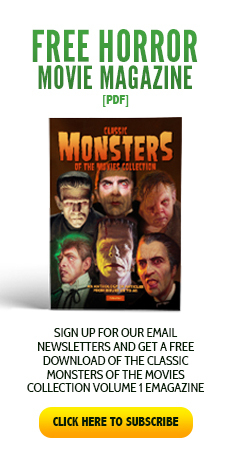 Evelyn Ankers was the only actress to star in movies devoted to the Wolf Man, the Frankenstein Monster and Dracula. Her performances in The Wolf Man, Ghost of Frankenstein (1942) and Son of Dracula (1943) – being menaced by Chaney Jr in all three – quickly led to her being typecast as the pretty yet vulnerable leading lady, and narrowed the range of roles made available to her. Her other horror and thriller appearances include Sherlock Holmes and the Voice of Terror (1942) with Basil Rathbone, Captive Wild Woman (1943), Inner Sanctum horror mystery Weird Woman (1944) and The Invisible Man’s Revenge (1944). 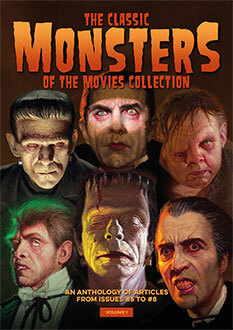 Following the end of World War II, horror movies fell out of vogue, and Evelyn Ankers left Universal. She starred with her husband, B-movie star Richard Denning, in Black Beauty (1946) for 20th Century Fox, as well as a handful of other movies, but shortly afterwards, at the age of 32, abandoned the Hollywood rat race in favour of a quiet domestic life. Over the years, she had become increasingly intolerant of Hollywood. As her husband’s career flourished, Ankers could finally concentrate on what she most enjoyed: being a wife and a mother. But she continued to work, starring in the mystery film Flight to Nowhere (1946) and a drama based around salmon fishing, Spoilers of the North (1947). 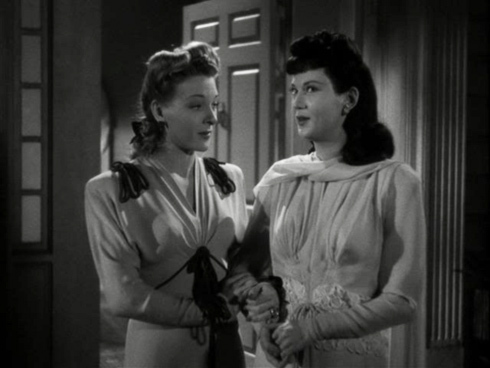 This was followed by The Lone Wolf in London (1947), in which she played a musical comedy star and murderess, and Parole, Inc. (1948) where she gave a glamorous turn as a nightclub owner. One of her most enjoyable parts was to come in RKO’s 1949 Tarzan’s Magic Fountain, in which as Gloria James Jessup she sought out a magic fountain of youth. She made her last feature film in the 1950 western The Texan Meets Calamity Jane – as the eponymous heroine. She did, however, step out of movie retirement in 1960 to appear in No Greater Love, also opposite Denning. Beautiful actress of the time. Horror princess of the time.